How to Use Hydrogen Peroxide to Lighten Hair. If you have ever dreamed of getting Marilyn Monroe's silky, pale-blond hair, you're not alone. Some people prefer to experiment with their hair color at home using natural ingredients or pharmacy hair lighteners. A classic way to bleach hair, and one that is very inexpensive, is to use hydrogen peroxide. 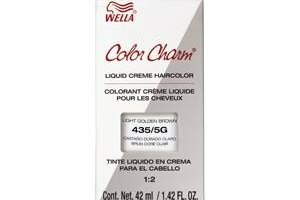 That same stuff in the brown bottle that you use on cuts and mildew also bleaches hair. Snip a small lock of hair from underneath your hair, where you can't see it. Tie some thread around it or tape it down to do a strand test. This will give you a preview of the color you will get with hydrogen peroxide, as everyone has different results. Mix a 50/50 solution of hydrogen peroxide with water and put it in a spray bottle. Spray it on your wet hair and comb it through. Leave on your hair for about 15 minutes then rinse. You should have all-over lightening. 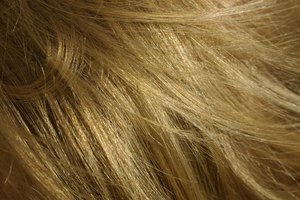 Highlight your hair by selecting specific strands to color rather than your whole head. 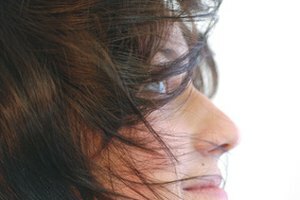 You might choose to lighten some hair around your face or choose thick chunks all around your head. Apply straight peroxide to these strands when wet and rinse it after 15 minutes. Use peroxide continually over time if it does not lighten your hair the way you want it to at first. Some people's hair takes longer to bleach and you may have to repeat the process several times before you are happy with the color. Apply a deep-conditioning treatment to your hair after you lighten it with hydrogen peroxide. The peroxide is very drying to your hair and can even cause breakage. Make an appointment with a professional hair colorist if you are afraid to experiment at home. While some people achieve the effects they want using peroxide, others have had disastrous results. Avoid this risk by letting a professional lighten your locks. 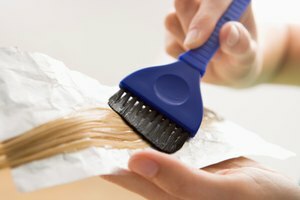 Use other methods for lightening your hair if peroxide doesn't work on you. Some natural lighteners include rhubarb root, vinegar, lemon juice and chamomile.